Changing the software’s skin to suit your needs is ideal because each party is held in different locations with different lighting and weather conditions. 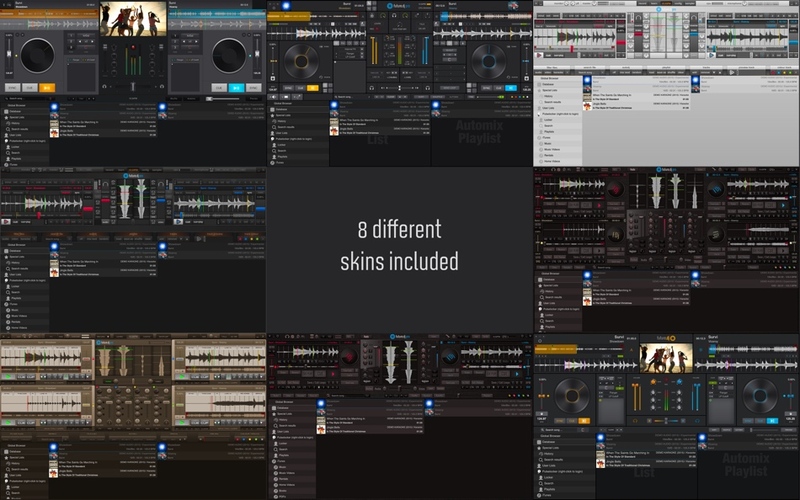 Future.dj pro is bundled with a set of skins that few DJs actually use to their advantage. For example day parties can often require a light (white) skin in order to pinpoint each command regardless of the amount of sunlight that hits your eyes. Daylight subconsciously makes you squint your eyes when looking at your screen. When clicking the Config button in future.dj pro, you will be greeted by the first settings that enable DJs to change the interface that can either enhance your control over the software. Plugging a MIDI controller with 4 decks and wanting to use those 4 decks to mix will require a simple change of clothes for the app in order to use your device at its maximum capabilities. DJs need to browse through the ‘outfits’ of their DJ apps as each outfit varies in features. Not only do skins look different, but, many of them have hidden functionalities that are only visible once applied on the software. One choice could show 8 assignable hot cues per deck while another has an advanced X/Y axis for effect parameters. Controllers with advanced functions can bring out features that appear to be non-existent on a particular interface and this is why it’s important to browse through your skin selection. So, change the skin of your DJ app every so often and discover new FX and parameters, advanced sampling banks and functions you may not even need until you’ve seen them in action.